Conor Doyle (colourist) and Grace Murphy (stylist) of Peter Mark Dundrum Town Centre took the top prize at the 2017 L’Oréal Colour Trophy. They share the how-to to their winning look. We wanted to create an on-trend look that was editorial but still relevant and achievable for a commercial audience, so using fabulous flush tones, we created a soft peach base enhanced with L’Oréal’s Colourful Hair. When we made it through to the final, we then set out to strip back the colour for this round of the competition, aiming to use placement and a more unusual colour palette choice that would challenge a judging panel’s eye and generate intrigue. Get the look: “We coloured our model’s hair using Platinum 20 Vol and Smartbond, bringing our natural base up to a very pale yellow. We then toned our blonde with DIA Light 9.01 and 9.11 to give it a clean, icy base, while contouring the hairline with 7.12 to provide a framing shadow. 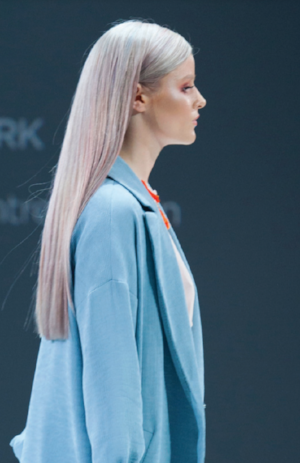 To create a statement shimmer in our look we used L’Oréal’s Colourful Hair, mixing up pale blues, oranges, soft pinks and violet tones. We placed microfine weaves into meche, painting our four colours onto the single packet but rotating colour patterns in each isolated section. No section of the hair contains the exact same placement as any other part of the head, which generates a different reflect throughout the hair depending on what angle the light shines.